I am one of those holiday eaters who live for leftovers. Yes, Thanksgiving dinner takes way too much time to make for the amount of time it takes to eat it (especially when its just two people), but the food is so good and you hardly have to cook at all for about a week (especially when Mr. Cleaver makes an amazing turkey stew)! 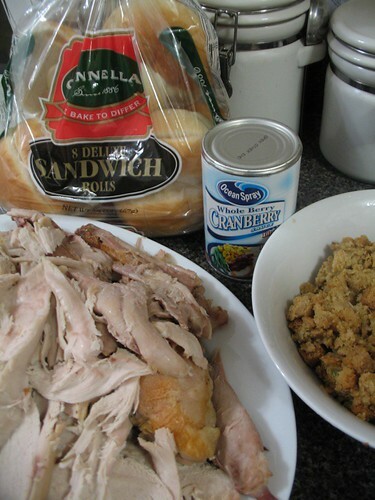 My favorite use for leftover Thanksgiving food is something I like to call "The Portlander." I call it the Portlander because I totally stole it from a New England bagel chain and that's what they call it. It takes no skill and is totally tasty. Put the two halves of the roll in the toaster or under the broiler and heat until warm - not toasty. Reheat the turkey and stuffing the microwave. 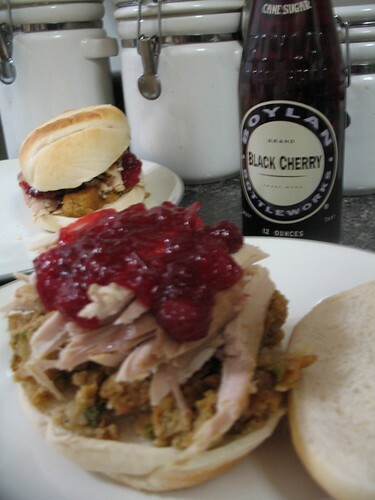 Take your warm roll and add a thick layer of stuffing, topped by the turkey and the cranberry sauce, put on the top half of the roll and enjoy how the flavors blend so magically!